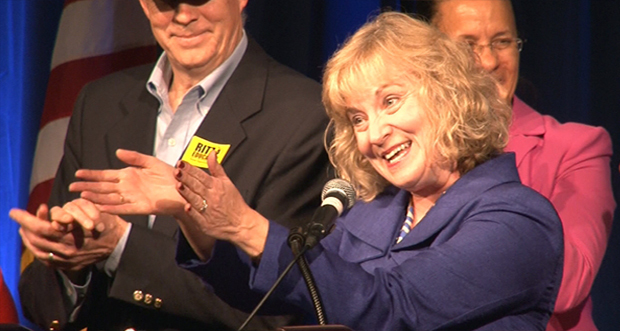 Democrat Glenda Ritz celebrates her victory in the race for Indiana Superintendent of Public Instruction. She unseated incumbent Republican Tony Bennett in the night's most stunning upset. Cindi Pastore had always sparred on Facebook with an old friend whose politics were decidedly more conservative than hers. The discussions were spirited and good-natured, but she never had luck much changing his mind. That is, until Pastore — a “semi-retired” special education teacher — brought up the race for state superintendent. It took a lot of back-and-forth, but she ultimately convinced this “die-hard Republican” friend to vote for Democrat Glenda Ritz. “I got him to split his ticket for the first time in his entire life. I was real proud of that,” Pastore says. How? She convinced him Republican incumbent Tony Bennett‘s policies were increasingly tying the hands of local school boards — or, in education parlance, undermining “local control.” Other Ritz supporters made similar arguments, Pastore says. Though Tuesday’s result is being framed as a referendum on Bennett’s school choice and accountability policies, Pastore’s account squares with poll numbers suggesting conservative voters responded to arguments that school boards should have control over their own policies. An especially effective talking point for Ritz’s supporters? 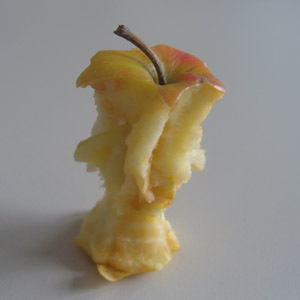 The argument that the Common Core represents federal meddling in local education policy. Bennett emphasizes local control when discussing his education policies. 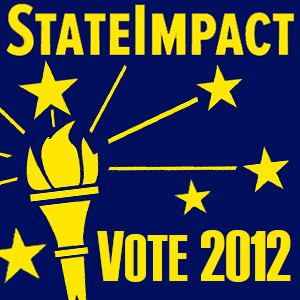 For instance, he supported the creation of a statewide teacher evaluation mandate. But Bennett’s system allowed school districts to locally craft their rubrics and systems for rating educators. But even Bennett acknowledged Wednesday his ardent support for the Common Core State Standards — national academic standards being implemented in Indiana and most other states — undercut his re-election bid. 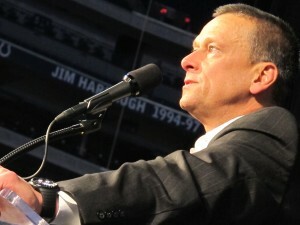 State superintendent Tony Bennett delivers his concession speech at Lucas Oil Stadium Tuesday evening. “She did a very good job of appealing to the strong conservative base who had problems with the Common Core. So that’s another issue obviously,” he told State EdWatch. Bennett himself repeatedly expressed that exact concern and tried to tell the administration to please back the hell off; they didn’t listen. Because Bennett thinks the Common Core is the right thing to do, he held fast nonetheless — and that drew the ire of onetime conservative backers, who’ve now lashed out in frustration. 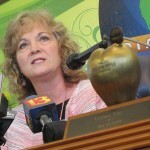 If Hoosiers wanted Glenda Ritz rather than Bennett, that’s cool. But Bennett would have beaten Ritz solidly (despite her staunch support from teacher unions eager to take him out) if the basketball-coaching, folksy, well-funded, native son had merely run as well as Romney. And exit polling and local accounts suggest that the reason he didn’t can pretty much be chalked up to conservative angst over the Common Core. Intentionally or not, the Obama administration has politicized the Common Core and, in so doing, is making it dangerous for elected Republicans in red states to support it. And, trust me, a lot of GOP state school board members, education committee members, and state chiefs are aware of what happened to Bennett. 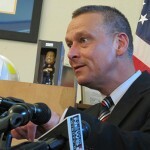 Bennett’s huge war chest allowed the state superintendent’s campaign to air television ads through the months of September and October. But Cindi Pastore’s account also demonstrates how the Ritz campaign was able to mount such an effective ground game, mobilizing teachers through social media — and old-fashioned personal networking. “Face-to-face, I probably had 50 conversations over the course of the last year, at least,” Pastore remembers. “I came up with about 15 [people] that I know for certain that I was the factor” in convincing them to vote for Ritz, she says. Ritz’s campaign also benefited from $173,000 in contributions from the political arm of the state’s largest teachers union. The Indiana State Teachers Association also offered to help mobilize teachers through its local chapters on Ritz’s behalf. But Pastore says press accounts are overplaying unions’ impact on the race. She was a union member when she was a full-time special education teacher in northeast Indiana, and says she’s proud of that fact. But she says she tried to distance herself from the union when discussing Ritz’s campaign.